In Simon and Garfunkel, Maguire and Patterson, Laurel and Hardy, Purcell and Stockwell, among a plethora of others, the world unearthed some famous partnerships. 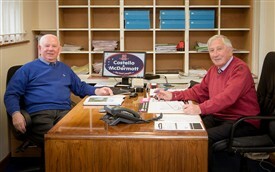 But few pairings have stood and survived the testing hands of time better than Costello and McDermott of Ballinrobe. 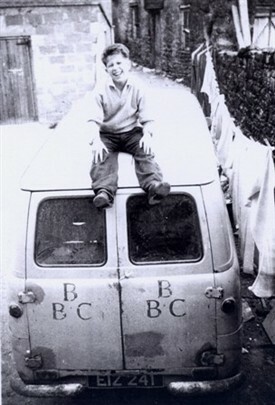 Down Partry way a young Eamon McDermott had given up school. “There was holy murder at home over that,” he remembers. Sculpting headstones was the McDermott family business and it became Eamon’s early introduction to working life. “On the very first day my father put a huge slab of rock on the bench and gave me a chisel and hammer". Within a few weeks he told me, but I knew anyway, I wasn’t cut out for that kind of work so I got a job in the old limestone quarry in Partry. I did a bit of everything there, including welding and fixing trucks, and as things eventually turned out it stood to me. “After that I got a job driving for Cummin's Hardware in Ballinrobe. Peter was in the ‘BBC’ and I was in ‘Number 10’ or the ‘House of Cummins’ as we called it” is Eamon’s jovial description of the time. Then fate kicked in. Another ‘BBC’ employee, Tommy Staunton of Partry, a former Mayo goalie, broke his leg playing a match with Ballintubber. Wally Loughrey was short a driver and Peter recommended Eamon. The dice was starting its roll. Not only were Peter and Eamon good salesmen but they were listeners too. “Did ye see the ice cream van on your travels?” was a repetitive question from Connemara shopkeepers. HB, Lucan Dairies and Palm Grove held the monopoly of that business and Pavilion Stores in Galway were the HB agents. But so lucrative was the Galway and Salthill summer market they only provided a staggered service to the rural areas. The two Boyos spotted the gap. In October 1964 they tendered plenty of notice to Wally Loughrey telling him they intended leaving his employment three months later on 1964’s farewell day. Two days before their departure Wally Loughrey sold his bakery business. BBC’s dough would become part of the Western Pride mix. Peter and Eamon had a dream needing an awakening. Armed only with a nucleus of a good idea and no more, they hired a car and drove ‘on speck’ to Thurles Creamery where Suir Valley Ice Cream was manufactured. They didn’t have a site or transport, but they were driven by ambition and a desire to succeed. “Sure there’s nothing up there but mountains and lakes,” creamery manager John Cleary said, as he scanned the map of the countryside they planned to distribute his product in. “Leave it with me to think about” was his only parting promise. 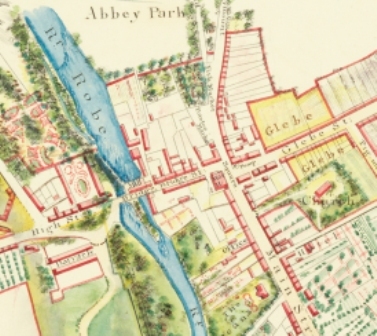 Weeks later, and unbeknownst to them, John Cleary visited the parochial house and Garda Station in Ballinrobe making inquiries as the characters of Peter Costello and Eamon McDermott. There was no still no word from Thurles so they made another trip to Tipp’ to the home of ice cream and hurling. “Did ye not get our letter?” Cleary enquired. They hadn’t, because the letter Cleary posted offering them the Suir Valley agency ended up in ‘Ballinasloe’. Now they had ice cream but nowhere to store it. Peter’s aunt in Cornmarket gave them a site that needed readying. Tommy Mellett did the groundwork and Eamon’s brother Miko, Phil Staunton and “the Partry Meitheal” (as Peter describes them) arrived with shovels and picks. The cold room Cleary provided was built, two Thames 800 vans, bought on hire purchase and on the evening of May 28, 1965, without fuss or fanfare, ‘Costello and McDermott’ commenced trading. “We owe a lot to John Cleary because he put faith in us,” Eamon McDermott acknowledges fifty years later. “But we didn’t get off to an encouraging start. The first shopkeeper we called to in Ballinrobe told us he was dealing with Pavilion Stores and he’d stay with them”. The next man said, “Lads, ye know nothing about this business so leave it to the experts”. Mrs Heverin in Partry said, “I think you’re mad going at this Eamon, but I’ll buy from you anyway”. Ice cream sales were dependent on summer. Ice cream in winter was akin to owning a surplus stock of Christmas trees on New Year’s Day. Peter and Eamon increased their product range. Peas, fish fingers and burgers were the only frozen food items available in the west of Ireland then. When Cappaquin Chickens came looking for a western seaboard distributor, it was to Peter and Eamon they turned. Weekly, in the dead of a Sunday night, Eamon drove to Dublin to Findus and Green Isle Frozen Foods depots to collect supplies. Peter and Eamon worked from early morning to late night. “We didn’t take a bit of notice because were young and energetic and we were doing it for ourselves and for each other,” is how Peter describes it. Ballinrobe’s Cornmarket was a hive of activity. Peter’s house became the administrative hub and Kathleen Gibbons, the office clerk, operated from a cubby hole under the stairs. Last week Kathleen sent Peter and Eamon a card congratulating them on making their notion the success it now is fifty years later. 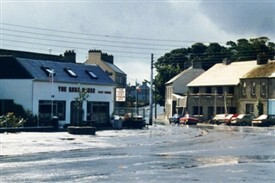 ‘Ballinrobe 20’ was the phone number of the Railway Hotel across the road. Umpteen times daily the receptionist ran over with an order from ‘Costello and McDermott’ customers. Tom Fahy operated a garage on the street. At all hours he and his mechanic John Browne were on call to repair a vehicle ensuring the wheels of a Ballinrobe success story kept turning. “But Eamon told them we’d take the HB agency and, a week later, we met them in Athlone and signed the deal to become their distributors in the west of Ireland. Thank God, from that day on, we never looked back”. “I think what stood to us was that we gave a good service. We were reliable, and if we promised we’d be there, we were. And in turn customers saw that and they always stuck with us,” says Peter. “They asked me out in Connemara when we started if we’d call during the winter, and I assured them we would. Fifty years later we’re still honouring that promise, three days a week. And why wouldn’t we, because when they had bigger suppliers however, they still kept space in the fridge for a box of our stuff”, explains Eamon. In time ‘Costello and McDermott’ quickly outgrew their Cornmarket base. In 1976 they moved to the Castlebar Road and today it sports two huge warehouse-styled cold rooms and employs a staff of sixty people plus. Peter and Eamon have handed the steering wheel over to the next generation. Peter’s daughter, Gwen, and her husband Martin, along with Eamon’s sons David and Daniel, are in the driving seat now. But the two men who first drove the vehicle to the success it has become are still mentoring from the back seat. They made a business, built among the mountains and the lakes an outstanding success. They presided over three currency changes, saw the demise of the small shopkeeper, and kept step with technological advancement, where the scanning barcode replaced the old carbon paper and the chubby pencil become the screen cursor. Peter and Eamon turned every stumbling block into a stepping stone. Of their partnership and how it has turned out, Peter summarises it first. “It always worked both ways and I enjoyed every hour of our partnership. I’d do it all over again and I know we both would” Eamon replies. “But how could we have fallen out when Peter was always down Erris way and I abroad in Connemara,” he adds with a smile. And even on their one niggling regret they’re both in total agreement. “We’re sorry Mayo didn’t win an All-Ireland in all that time. . . ” they chorus together. This page was added by Averil Staunton on 22/05/2015. Worked for them in 1980 for 6 months. Treated very well. Expected hard work and I was well rewarded with a good pay raise. Greetings and I hope you remember the Chicago guy.